Over the course of time, few bands will experience a meteoric rise to stardom based on their quality of music that will have a lasting notation on the timeline of music evolution. 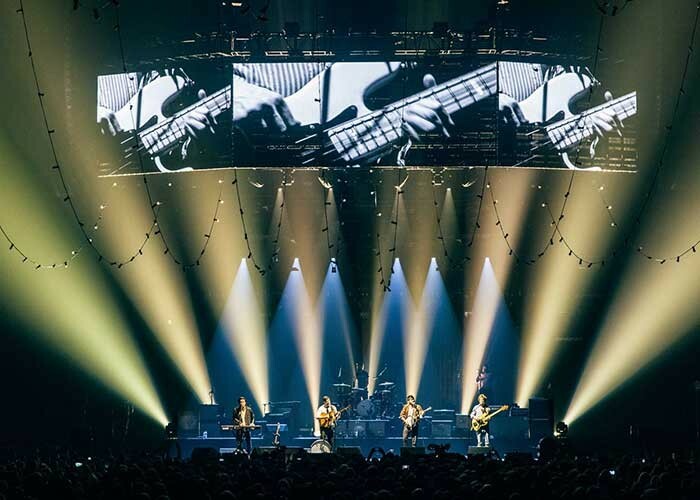 Such is the case with multiple Grammy Award-winning artists Mumford & Sons who in 4½ years have risen from playing small bars and clubs across America to now headlining a sold-out world tour. 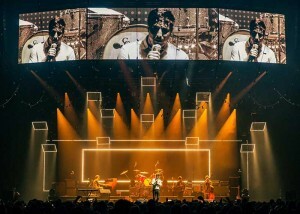 Having been with the band since the beginning, lighting designer Edward Warren was now entrusted to create their largest tour rig to date, and working with authorized Vari-Lite dealer Solotech he chose to fill it with 33 VL3015 Spot and 21 VL3500 Wash FX luminaires from Philips Vari-Lite. "Being a part of the Mumford & Sons experience is something that is quite unique and exciting," started Warren. "From day one we have always been about incorporating the crowd into the show so that they too can be a part of the experience. To do this we need broad zoom ranges for the luminaires hanging out over the crowd, and then we also like to do more traditional tungsten, almost dusky, looks to the set. For my moving lights in this rig, I needed them to be able to provide a great band and crowd wash with beautiful color, but then I also needed great optics and crisp gobos as well. 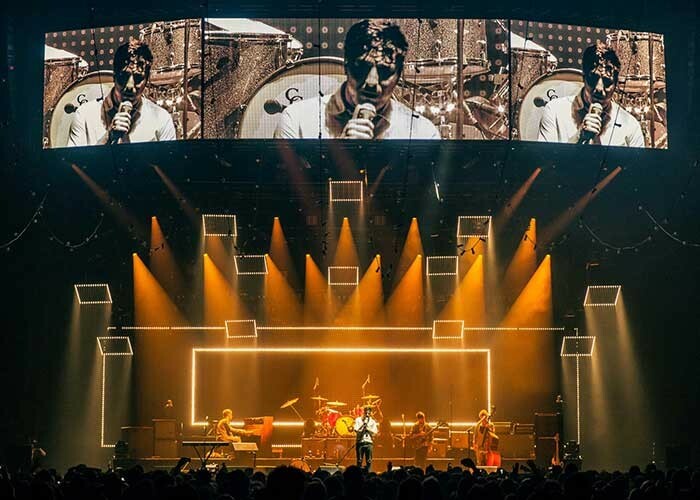 That’s when Karl Gaudreau with Solotech suggested we use the VL3015 Spot and VL3500 Wash FX luminaires from Philips Vari-Lite." With the tour lighting rig now confirmed, Warren and Solotech got to work, first bringing the show to life in their shop in Montreal. Warren explained: "I enjoy working with the Solotech because they have a great facility and it was nice to be able to set the entire rig up at their shop and take the necessary time to get it ready. They are very technically minded and make suggestions without forcing anything on you. I really enjoy that they take the time to develop a great amount of trust and respect and our set-up for the tour went fantastic." 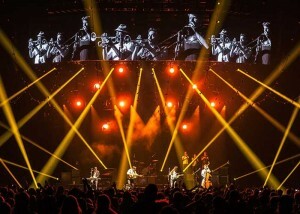 As the production elements stood ready, the Mumford & Sons world tour continued on its way. Anxious and excited to see how the rig would now perform in each venue, Warren was not disappointed. "In the design the VL3015 Spots tie the stage together quite nicely. 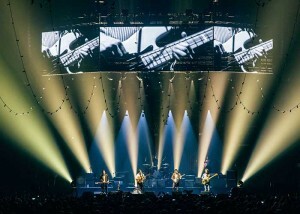 They are the link between the LED light panels above and the band onstage. I like to use them to spot the band from behind but we also use them to wash the crowd and then at times we narrow them down to shoot tight beams into the sky and they work great for that. The optics of the VL3015 Spot are awesome. You can get both a massive zoom out of it and then alternatively when you bring the iris in tight they can match the tight beams currently seen from other lights on the market now. The fact that the VL3015 can go from so wide to so tight is quite impressive." The VL3015 Spot luminaire provides the increased output of a highly-reliable 1500W double-ended short arc lamp and also features 6:1 zoom optics, CYM color mixing, variable CTO color temperature correction, a six-position color wheel, three gobo/effects wheels, a beam size iris and separate dimmer along with ultra-fast strobe mechanisms. Two reflectors are standard on the luminaire allowing users to choose between either a peaked or flat field beam. In the peaked beam, the fixture provides 27,000 lumens of output, and in the flat field beam, an output of 22,000 lumens is achieved. Reflectors are easily changed, and whichever one is not chosen rides securely inside the luminaire on a specially designed mount. Warren continued: "With the VL3500 Wash FX, I have three on either side of the stage to side light the band and create more depth to the stage, six on the downstage truss to spot the band from above and then I have nine upstage in front of the LED wall which I use to give a backlit look using the FX patterns to silhouette the band. 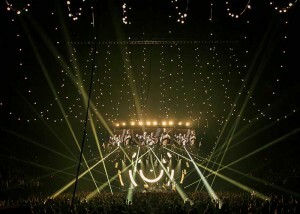 They also help me create a great sunrise effect with their tight beams fanning out over the crowd." 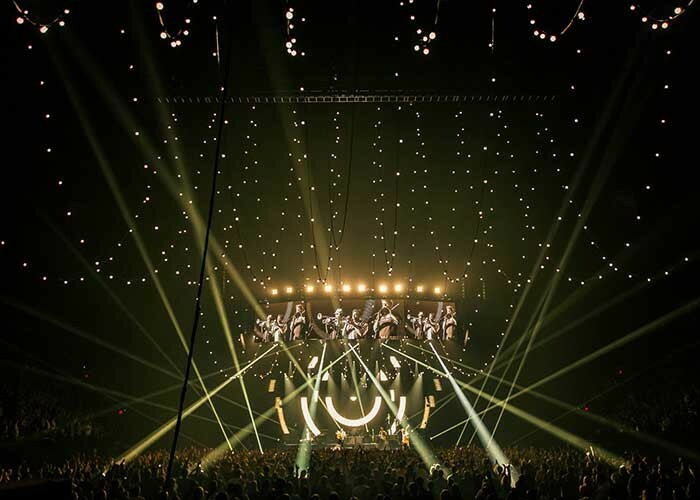 With an output that exceeds 50,000 lumens, the VL3500 Wash FX luminaire features internal zoomable beam optics with either Fresnel or Buxom options, an interchangeable front lens system, and a pattern wheel that allows users to harness the tremendous intensity of the luminaire to project effects patterns. The fixture also provides CYM color mixing, variable CTO color temperature correction, dual five-position color wheels, a separate dimmer, and an independent dual-blade strobe mechanism. In conjunction with its zoomable optics system, the VARI*BRITE mode can be engaged to offer a tight column of remarkably intense light making the VL3500 Wash FX one of the most versatile wash luminaires available today. "In looking at the fixtures used for the tour another concern was the reliability and durability of the lights which can really make the job of our crew members a lot easier," concluded Warren. 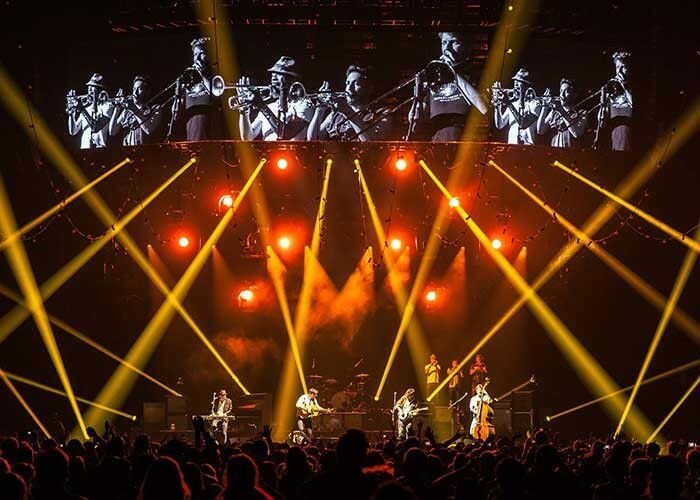 "We needed lights that wouldn’t give up because we do a lot of outdoor shows with overnight load-ins. The lights have to be reliable and Vari-Lite fixtures are known for their reliability. The VL3015 Spots and VL3500 Wash FX have all been working great and night-after-night they give me a great range of colors and also the warm tungsten looks as well. When you put all this with the optics, the Vari-Lite luminaires really have been a dream come true."